Ascaris lumbricoides, more commonly referred to as the intestinal roundworm, is the largest intestinal nematode known to infect humans. Female intestinal roundworms can measure up to 40cm in length and 6mm in diameter and are white or pink in coloration with tapered ends. Adult roundworms inhabit the lumen of the small intestine of humans. If both male and female species are present within the same hos, the female roundworm produces about 200,000 fertilized ova per day. Ova are oval shaped and have a thick shell. Once the ova are produced by the female, they exit the human host through feces. They ova embryos then develop into an infective second stage larva for 2-4 weeks. If the ova are ingested by a human, they hatch inside the small intestine and release larvae that penetrate the intestinal wall and migrate to the heart and lungs. Once inside the lungs, the larvae mature for 10 days and travel up the trachea and are swallowed. Once back inside the small intestine, the juvenile roundworms develop into mature adults. 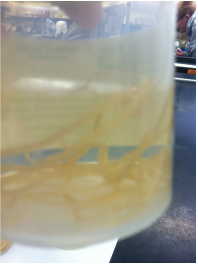 After approximately 2-3 months, the female intestinal roundworm will begin to produce ova to complete the life cycle. Ascaris lumbricoides can be found world-wide. They are highly prevalent in tropical and subtropical regions and areas with poor sanitation. Warm, wet climates favor the transmission of intestinal roundworm year-round. In the U.S., the intestinal roundworm is the third most common helminth. Infection from Ascaris lumbricoides is one of the most common helminthic human infestations in the world. Although intestinal roundworm infections affect people of all ages, children between the ages of 2-10 are at the highest risk because they may not have developed proper sanitary behavior. Infestation from the intestinal roundworm can be successfully removed through proper diagnosis and drug therapy.